A few successes, a lot of disasters! As mentioned in my last post, it was Neil’s birthday a few weeks ago. As this was a bit of a special birthday, I was determined to make him a bit of a special cake so that he could wallow in chocolate goodness at reaching the big 3-0! I am a massive fan of the Great British Bake Off and am, in fact, rather gutted that the most recent series finished last week. 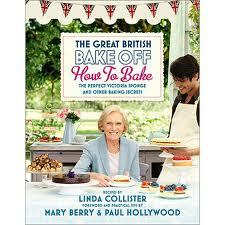 Thank god there are the cookbooks to keep me occupied until the next series! I have not purchased the more recently published ‘How to Turn Everyday Bakes into Showstoppers’ but I really do not think I can justify the purchase as the shelves in my dining room are already straining under the weight of my cookbook collection and there are many, many recipes I have not yet mastered from the book from the second series, ‘How to Bake’. As I have been in awe of all of the most recent contestant’s knowledge and skills, I have decided to make more of an effort to expand my baking repetoire…watch this space….. Anyway, back to Neil’s cake! 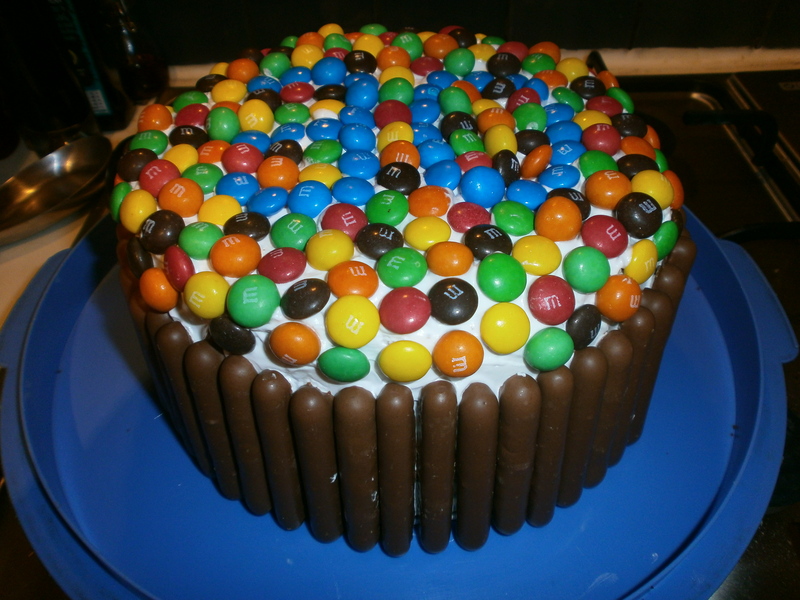 I made a few deviations from the recipe however, as Neil is a bit of a chocaholic and particularly likes M&Ms, I wanted to include some extra tasty treats in the decoration. 1. Grease two 20.5cm sandwich tins and line with baking paper. 2. Preheat the oven to 180 degrees. 3. Put the cocoa powder into a heatproof bowl and mix with the boiling water until smooth. Stir in the bicarbonate of soda and leave to cool. 4. Break up the chocolate and put into another heatproof bowl. Set over a pan of simmering water and melt the chocolate, stirring occasionally to ensure it doesn’t burn. Once the chocolate is smooth, remove from the heat and allow to cool. 5. Put the margarine into a large mixing bowl and beat with an electric mixer or spoon until creamy. Slowly beat in the sugar and beat for 5 minutes until the mixture is light. Mix together the eggs and vanilla then add to the butter mixture a tablespoon at a time, beating well. 6. Fold in the flour in three batches, and alternate with beating in the sour cream. Stir in the melted chocolate and cocoa liquid. Beat until everything is well combined before dividing between the two cake tins. 7. Bake for about 30 minutes until the cakes are risen and just firm. Run a knife around the inside of both tins to loosen the cakes and then turn each cake out onto a wire rack and allow to cool. 1. Separate the eggs and discard the egg yolks. 2. Place the egg whites and sugar into a large heatproof bowl and place over a pan of simmering water. 3. Using an electric mixer, immediately whisk in the remaining ingredients along with a pinch of salt. 4. Whisk on full speed for 7-12 minutes until thick, glossy and meringue like. The mixture should form a soft peak when the whisk is lifted. 5. Remove the bowl from the heat and whisk for a further 15-20 minutes until the mixture has cooled, turned very white and has started to stiffen. ‘How to Bake’ recommends slicing each cake layer in half so that you have a four layer cake however, I did not do this and decided to have only a two layer cake. I was too scared of messing the cake up and having to start again, I know my skills and baking precision is not one of them!! To assemble, put a large blob of icing on your preferred cake stand/plate etc and cover it with the first cake layer. Cover the top of the first layer with icing then place the remaining cake layer on top. Cover the top and sides of the cake in a thick layer of icing using a pallet knife. I then decorated the cake by sticking almost three boxes of assorted chocolate fingers around the sides of the cake conveniently covering up any icing mishaps or crumbling cake! 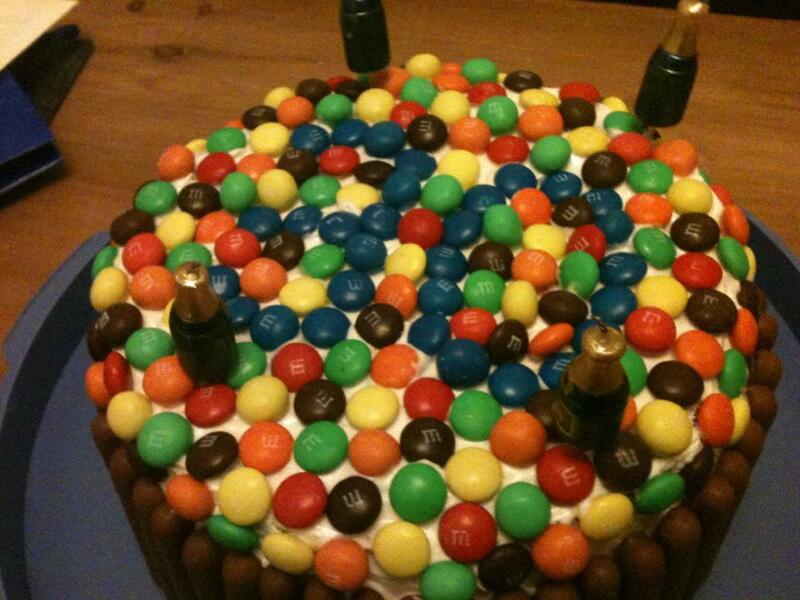 The top was covered with a share-sized bag of M&M’s, using blue M&M’s to write ’30’! The cake did take me quite a while to make and was, quite literally, back breaking work (My back unfortunately went two days later!!!). The icing was quite hard work for someone with arthritis as it involves using an electric whisk solidly for half an hour which took its toll on my poorly wrists and arms! I did, however, really enjoy making this cake for Neil but what was even more enjoyable was surprising him with it the next morning whilst treating him to a somewhat out of tune rendition of ‘Happy Birthday’….our neighbours must hate me!! We both treated ourselves to a slice later that day and I can confirm that the cake was worth the effort, especially as Neil enjoyed it so much. What better way to show your love for someone than through the medium of cake!! Live, eat and breathe the joys of good cooking, great food and fantastic local producers. i’ve never baked before but i remember my ma used to bake me one on my bday with M&Ms back in the day. looks easy enough ill try it on my my son when he’s born. Pingback: Devil’s Food Cake (and Chocolate Whipped Cream Frosting) | And Such Small Portions! My name is Sarah, self confessed foodie and amateur cook. 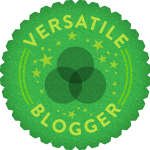 On these pages you will find lots of recipes, reviews and food related banter. Thank you for stopping by, happy reading! Recipe: Chorizo, Asparagus and Cheddar "Cupcakes"